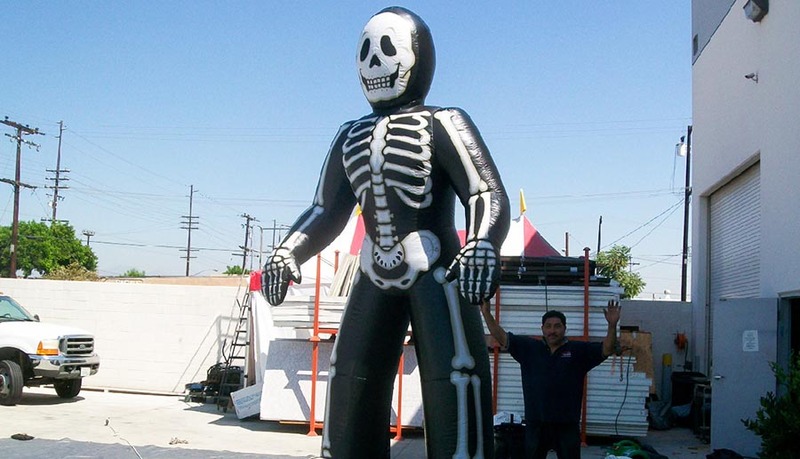 Halloween Inflatables | Decorate with a spooky inflatable! Halloween season is here, are you ready? Halloween is a special holiday that is celebrated worldwide in a variety of cultures. This special occasion marks the beginning for the holiday season all throughout the states. The much anticipated holiday is a so popular that the entire month is spent preparing for the holiday. Our question is, are you ready? Find the scary character of your choice below and use it to decorate your lawn, business or event. You can rent or purchase the inflatable of your choice. Mary Shelley's beloved creature is among the most iconic halloween monsters. 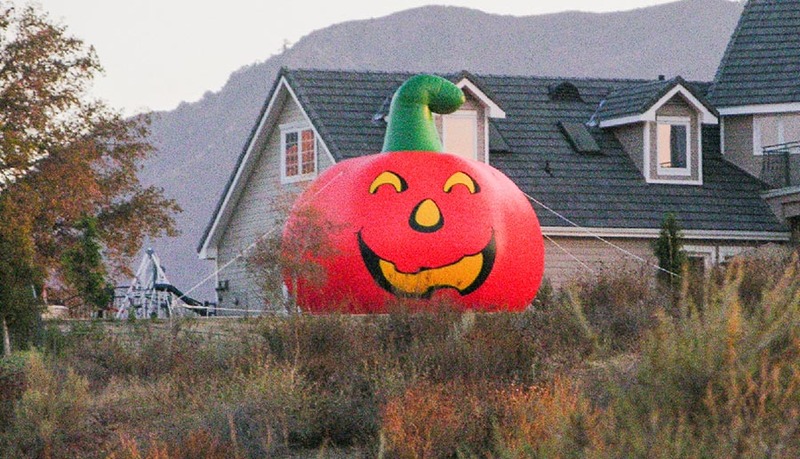 Pumpkin carving is a tradition but why carve a pumpkin when you can inflate it? Spiders are pretty scary. 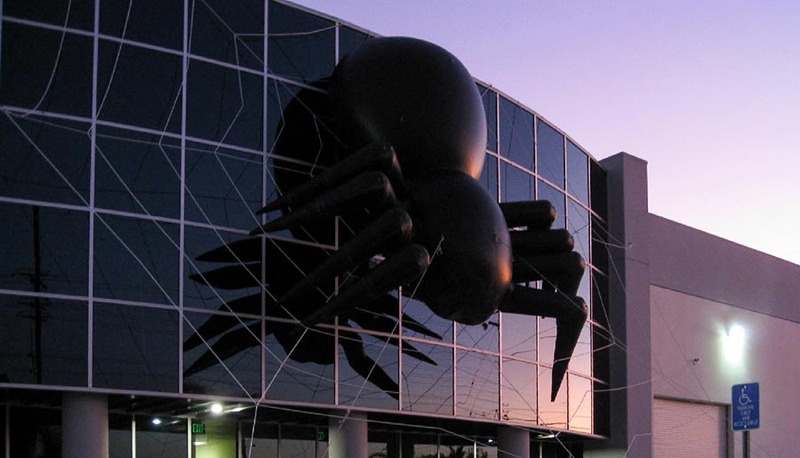 A giant spider attacking a building is even scarier. Where would halloween be without witches and their incantations? We wouldn't have "dia de las brujas" that's for sure. 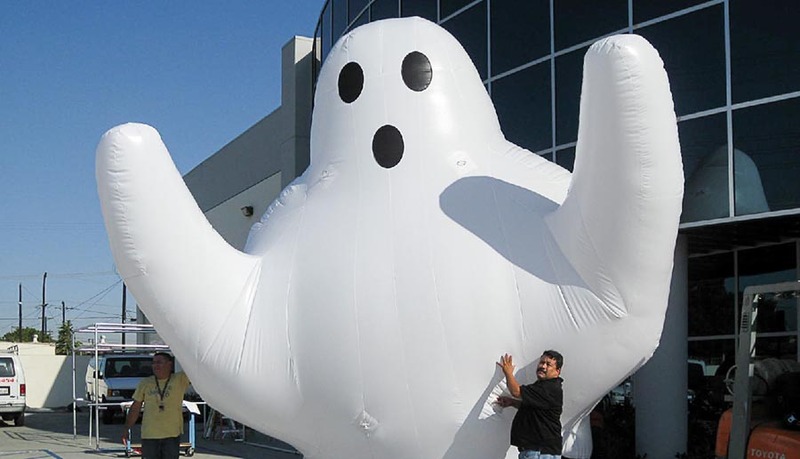 Our giant ghost is not haunted, we promise, rather it is somewhat friendly with its bubbly shape and demeanor. The Grim Reaper personifies death with its skeletal face, black cloak and of course, his giant scythe. Skeletons are a huge part of Halloween. They signify the resurrection of the dead coming to life. Find the size you need, tell us where you want it installed and we'll set a date to install it. How do you qualify for a free installation? As long as you are within 30 Miles of our location in South El Monte, CA, we will install it for free. All of our products are American made. 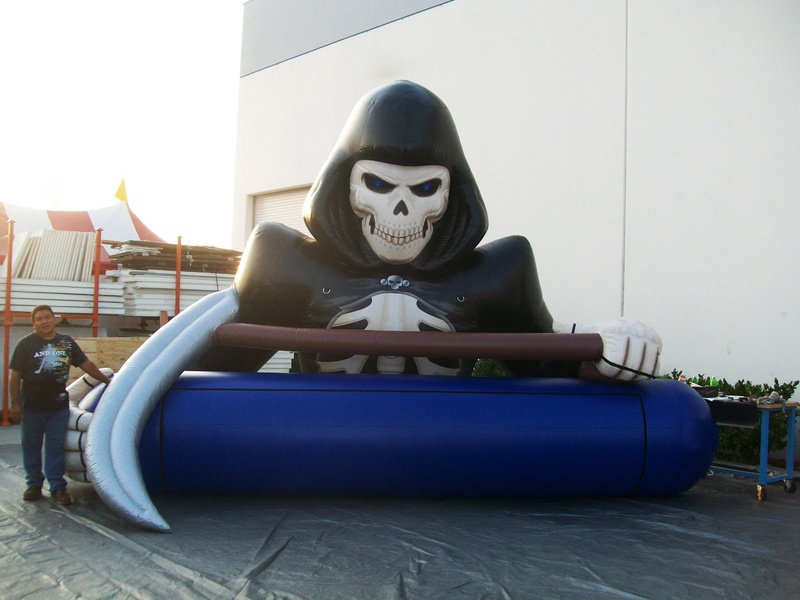 Every one of our inflatables is made of heavy duty vinyl material. We have multiple sizes available for you to choose from. 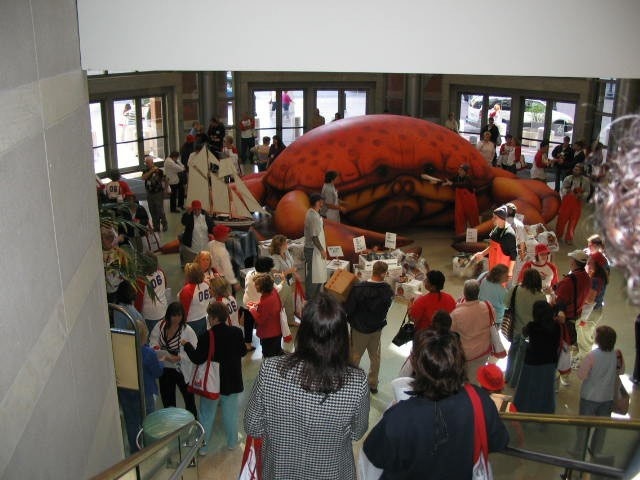 Did you know you can customize any of our inflatables? Add logos or a custom banner to one today. 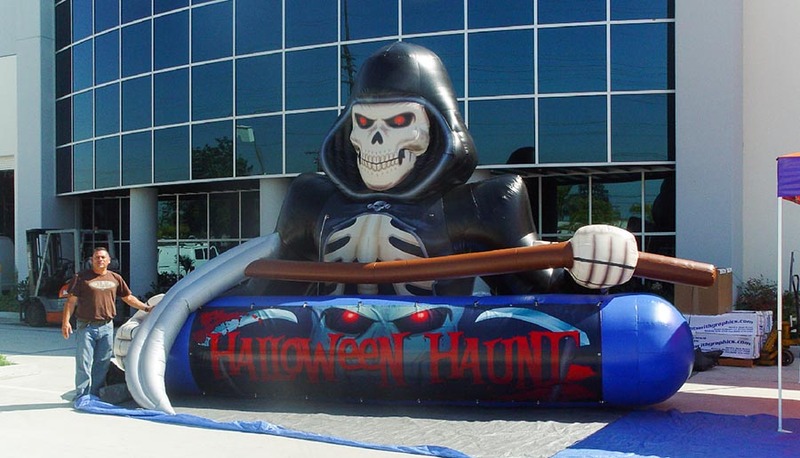 If you cannot find the inflatable you are looking for in our Halloween line-up, let us know and we can help you develop one just for you! What goes into making an inflatable? Our inflatables are manufactured of the absolute best materials possible to ensure a long life span and year of durability. All of our printed inflatables can be created into any size you need, just let us know so that we can prepare our production floor. Production floor? Yeah, that's right! We develop all of our inflatables in the states! We do not like cheap inflatables that cost so much and rip rather easily. Our founder set out to fix this while bringing his large friends to life (not literally, that would be scary). 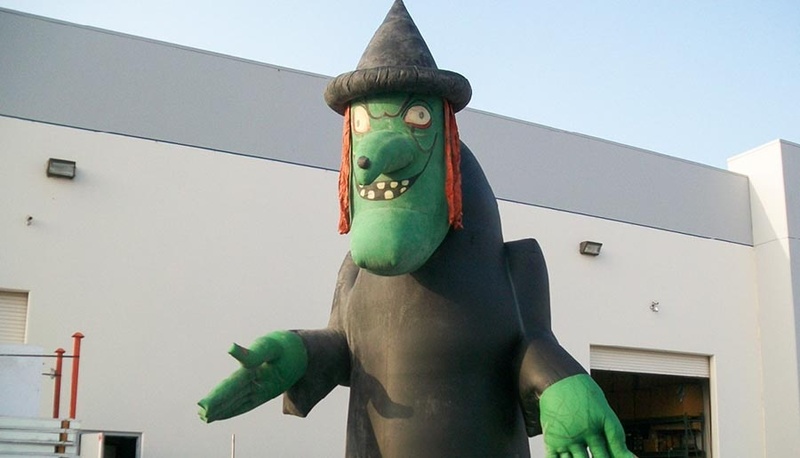 he founded our company in 1984 and has been creating custom inflatables ever since. 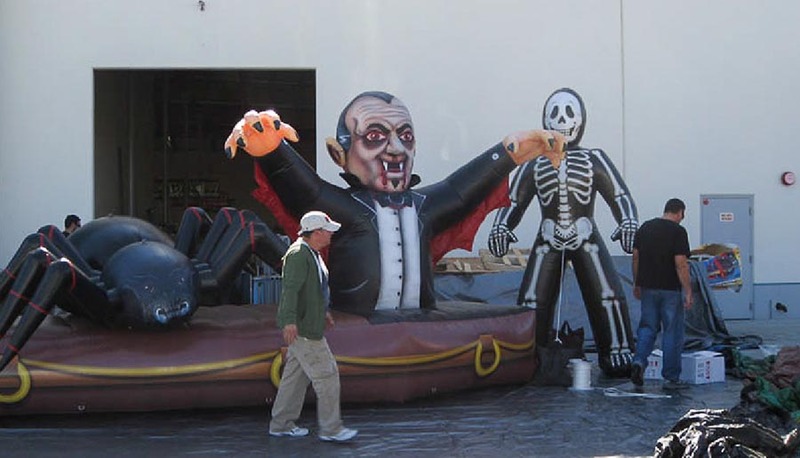 While doing so, he fixed multiple issues other inflatables had and at the same time created the most realistic and properly shaped inflatables available on the market. All of our custom inflatables come with a great warranty and we apply a layer of a proprietary protective coating on them. This protective coating protects the prints from scratching, fading and peeling off the inflatables. 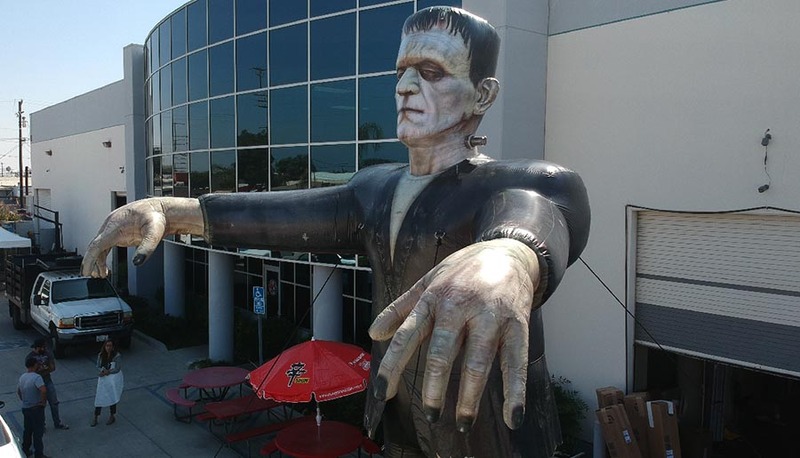 Through the printing process we add depth and character to each inflatable, like frankenstein for example. His nails, skin, hair and eyes, were all designed by one of our talented digital artist. Would you like to know more? Click the button below!